This is a refreshing, raw soup with a savory flavor. I served it up with sprouted bread topped with hummus. This recipe makes quite a bit…3-4 cups (full blender)…so if it’s just you, you might want to cut it in half. 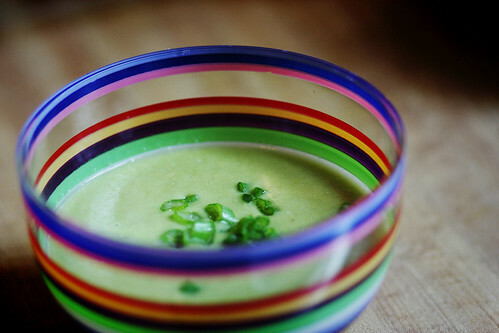 I found this on Gone Raw…here is another version of cucumber soup to try as well. Place all ingredients in blender and blend until smooth. Top with with scallions, cilantro, tomatoes, sprouts, and/or more avocado….yum yum! Entry filed under: Raw, Soup. You are doing really well with Raw Foods! Go You! I sent you that book today and now I am wondering if you want me to send you Victoria Boutenko’s book “12 Steps to Raw Foods: How to End Your Dependency on Cooked Food.” It’s the revised and expanded edition. And if you haven’t already read it you will enjoy. It is amazing! I will be glad to send it if you think you would be interested. Let me know how much longer you will be at this address. LOVE that bowl! The colors are so vibrant!